There are few things as fun and exciting as a good old hunting trip. 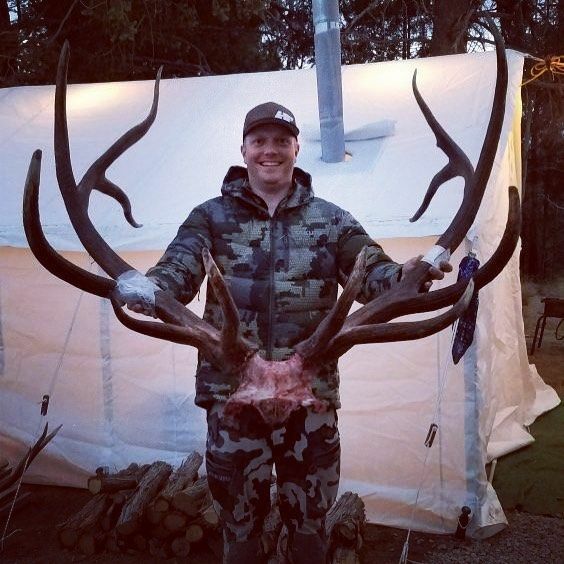 Besides putting meat on the table, they are opportunities to spend time in nature with friends and family, participate in age old rituals, and the dreams of bringing home a trophy that you can put on your wall. However, no matter how fun it is, it is important to remember how the shelter you choose for a trip can affect the trip overall. Without the right shelter a hunting trip can go from good to bad in a matter of minutes. For that reason, we have put together a list of the top 4 best hunting tents on the market today. We don’t want to toot our own horn, but we honestly do believe that the tents we sell here at Elk Mountain are the best on the market. They come at a low price point, are durable, and are more versatile than any other tents you’ll find. However, let’s take a look at some of the features that you’ll see in your Elk Mountain tent so you can see why we deserve to be in the top 4. One of the biggest factors that most of us have to consider when trying to purchase a large piece of equipment like a hunting tent is price. On the market today you can find tents for all sorts of prices and types of tents, some reasonable and some not. Wall tents can range from $700 to $3000. Many companies will list their tent a good base price by the time you add all the features you want and need you can easily add a $1000 to the purchase. Our approach is completely different than any other wall tent company. We give you all the features at price point less then what other companies base prices start at. There simply is no other tent company that beats our prices. Feel free to check out our price comparison chart comparing several leading canvas tent companies. 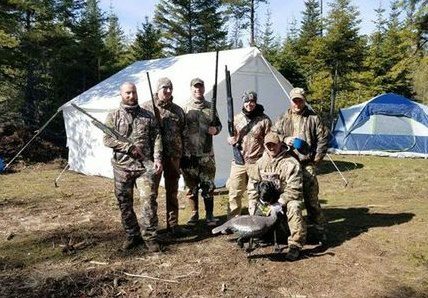 After price, someone looking to buy a hunting tent should be looking at how long the tent is going to last them. This is another area where Elk Mountain Tents shine. Elk Mountain Tents are made of high-strength polyester that not only makes it waterproof but also makes it more resistant to ripping and tearing. Not to mention, since it is a polyester hunting tent, it won’t shrink like any tent made out of cotton. We bring modern technology to traditional hunting. A problem with a lot of tents made of cotton canvas is rot, mold, and mildew. This is because of the fact that cotton is porous and organic. Polyester, on the other hand, is not organic and will not succumb to rot or mildew, meaning it will last you for a very long time. For more details and specs on our canvas material, including the exact rip and tear strengths, check out our FAQ page. The ventilation in our Elk Mountain Tents is easy to control. No matter what climate you are in you can keep your tent from getting hot, cold, or stuffy with ease. 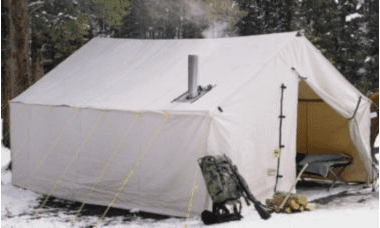 Although wall tents are made specifically to be able to use a stove in the winter, we have found that most people use their tent all year around and having the windows for ventilation is a must. 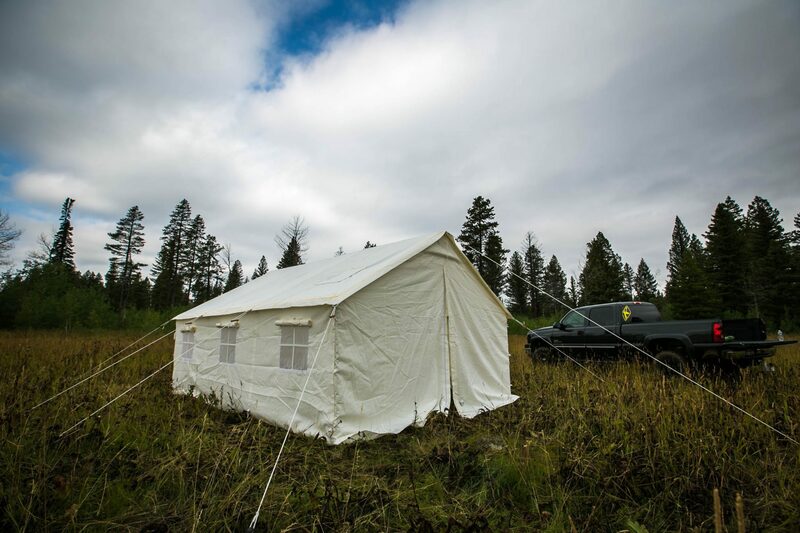 Elk Mountain Tents come standard with either 4 or 6 windows. You can read more about the standard features HERE. Often people ask how the tents will stand in the wind. A tents ability to withstand the wind ultimately comes to how well it staked down and tear resistance of the material. As stated already our material has a higher tear resistance then cotton. In order to make sure your tent is staked well, we send 18” heavy duty steal stakes with ropes and tensioners. We also have medal d-rings around the bottom of the walls that attach to the tent with heavy webbing. Most wall tents are custom made. This can mean waiting 2 months for your tent. Make sure you take this into consideration. Most Elk Mountain Tents arrive within 3 or 4 days of ordering. 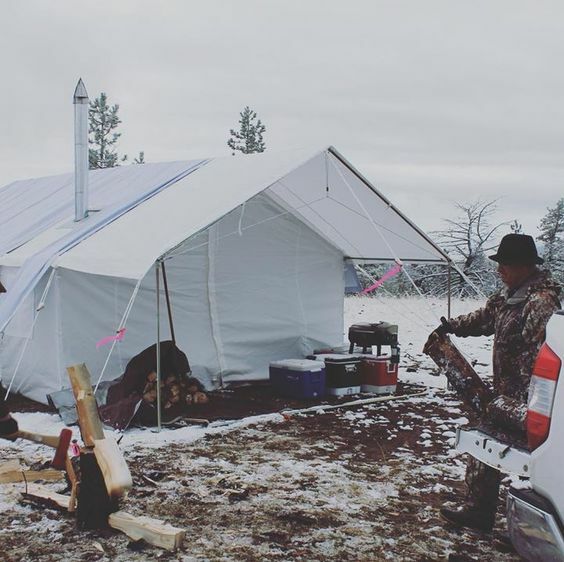 Montana Canvas is the most well know wall tent company. They sale in places like Cabela’s and other retail stores. 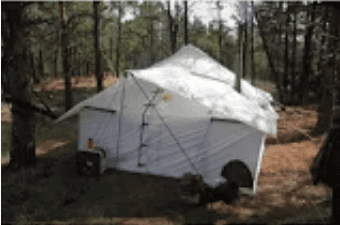 Like the rest of these tents on this list, tents from Montana Canvas are not only just for use when hunting, they can be used in many different ways. However, as a hunting tent, products from Montana Canvas are quite good quality. They put a lot into research, development, and marketing. If you have the time they can even make custom tents to fit your individual needs. The traditional Montana Canvas hunting tents are made out of natural canvas that is treated to be mildew inhibiting. You can also get some that are fire-retardant and, according to their website, meet “the California Marshall fire specifications.” They also make a tent out of product they call Relite. Another good thing about the Montana Canvas tents is that their windows are opened and closed with zippers. This allows them to be closed up tight with ease. One great trait of these hunting tents is that they have grommets on the inside of the walls so it can be staked down on the inside or outside of the tent. This, coupled with the 12’’ sod cloth that extends from the bottom of the tent, makes it harder for water and wind to come underneath the walls and into tent. It combines the functionality of a wall tent with the style and performance of a spike tent. They are great for hunting because of their wide array of uses and many features. Here are a few of the features of the Selkirk Spike tent. 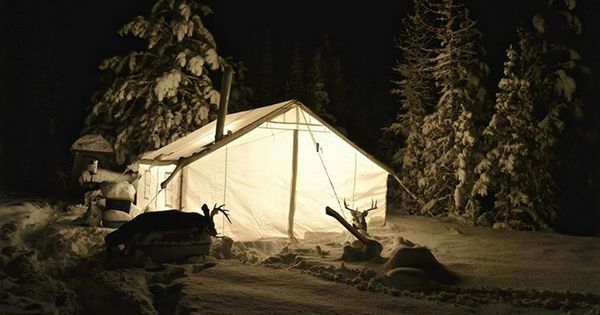 While spike tents can’t normally handle heavy snow loads, the Selkirk Spike Tent can. This is thanks to the 6 vertical poles holding the roof up it has more support for when the snow comes. Other spike tents don’t have as many poles so they buckle under the weight of a lot of snow. One of the features that Selkirk prides themselves in is their sewn-in floors. These are very handy for keeping out bugs and pests of any kind leaving you tent free of anything small you don’t want crawling around your stuff. Like most of the other tents, the Selkirk Spike Tent’s canvas material can be treated for several different things. While it appears that you can’t choose more than one treatment, they are both useful for all types of environments. The two treatments that they offer are ‘water and mildew’ and ‘fire’. As with most of the gear that Cabela’s sells, the Alaknak tent has a lot of features. You can get one as big as a 13’ by 27’, making it the largest tent on our list, and comes in at a price point of roughly $1,500. If you have a Cabela’s local, you can walk in and pick one up saving you time. If you are looking for a tent that will have room for the whole gang then this is a good one. The Cabela’s website says it can hold 10+ cots along with a wood burning stove. 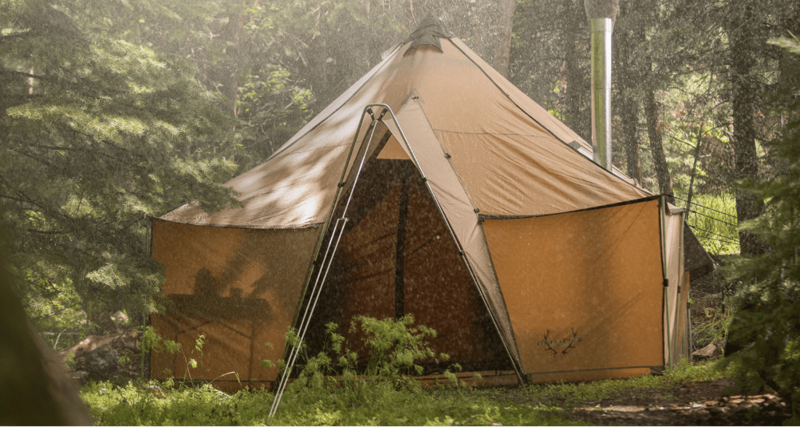 Although this is a polyester material that gives you some of those great benefits, it really is nothing like the Elk Mountain Tent. It is much thinner and is almost like a nylon tent that does not breath as well. This tent got a lot of negative reviews when it came out because of the poor breathability of the material. They then added some upper vents to help with this. Off all the wall tents on the market, this is the one we don’t suggest. These tents will buckle and collapse with high winds and a little amount of snow. You do get a lot of features with these tents and the price is right, but the risk of having your tent fail is too great. Hunting tents are amazing and can really bring a whole new dimension to your next hunting trip. If you want to get the most out of your outdoor experience, we suggest you get the kind of a tent that you only have to buy once. Each company has its strengths and weaknesses. For overall overall durability and value, we recommend the canvas tents sold by Elk Mountain Tents.